For the season of feast and festivities, nothing beats the classic and decadent Filipino desserts. 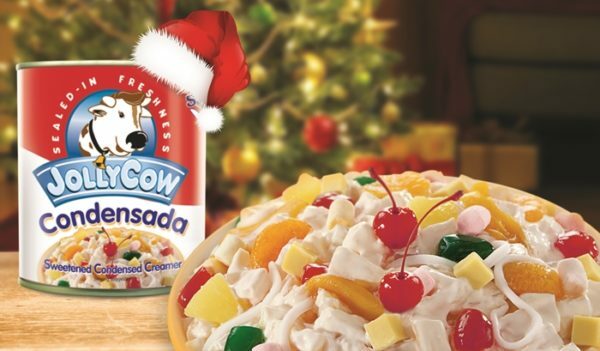 Find joy and comfort from these incredibly affordable recipes that’s made creamier and perfectly sweeter with Jolly Cow Condensada, the all-time favorite dessert ingredient to round out your holiday meal. 1. Drain all the water from the cans of the fruit ingredients. 2. Combine all ingredients (except for the marshmallow and cherries) in a large mixing bowl and blend well. 3. Place in a container and chill for 2 to 3 hours before serving. 4. Serve with mini marshmallow as garnish on top and put a cherry if desired. 1. Put sugar in a saucepan. Bring to a boil over low fire until the sugar caramelizes. 2. Pour the caramelized sugar equally into three llaneras. Evenly coat the caramelized sugar on the bottom of the llanera. Set aside. 3. In a bowl, gently mix together the Jolly Cow Condensada, evaporated milk, egg yolks and the grated dayap. Make sure to gently mix so as not to create bubbles on the mixture. 4. Gently and evenly pour the mixture on the llaneras containing the caramelized sugar. 5. Cover each llanera with aluminum foil. 6. Steam for about 30 minutes or until firm (steaming time may depend on the thickness of the llanera). 7. Cool and then refrigerate. Tip: You can tell when the leche flan is fully cooked by inserting a knife in the middle of the mixture–if the knife comes clean, it is fully cooked. 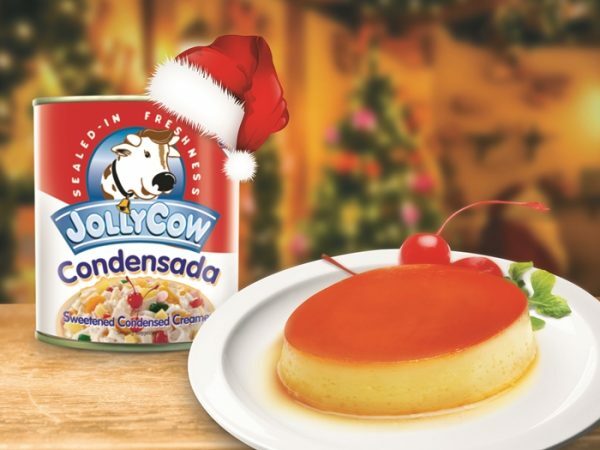 Jolly Cow Condensada is available in leading supermarkets and groceries nationwide. Fly Ace Corporation is one of the leading food and beverage consumer goods companies in the country today. Propelling limitless multiple-category growth by bringing the best of the world closer to Filipino homes, Fly Ace Corporation’s portfolio of food and beverage products includes house brands and exclusively distributed brands. Learn more at www.flyacecorp.com.